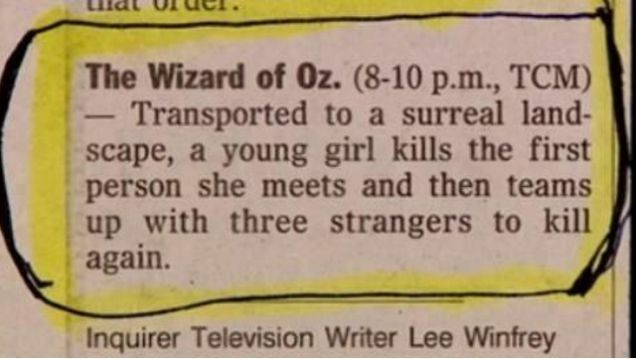 Who’s Afraid of the Wizard of Oz? Miss Malaprop came home from preschool the other day and informed me that one of her little mates had brought in a DVD of The Wizard of Oz. Now, given that both my children are in equal parts blessed and afflicted by active imaginations, The Wizard of Oz is one movie we’ve, shall we say, kept in reserve for the time being. Not because we’re cruel, unfeeling parents — no, no, no. We simply value uninterrupted sleep. Possibly to the point of obsession. “Did you watch it?” I inquired, as casually as I could, trying not to hold my breath or to further elevate my already rapidly rising blood pressure. “Well, not all of it,” came the initial response, at which I might have winced: my sleep deprivation sensor had, even at this early stage, been well and truly triggered. “Did you like it?” I asked, unable to keep the slight tremor of trepidation from my voice. We dealt with the green faced witch first, given that this was Miss Malaprop’s main object of preoccupation. Marvel Girl raced to her room and returned with a Guardians of the Galaxy poster she had pulled from her wall, pointing out that Gamora not only has a green face but that she is also roughly twenty-seven kinds of amazing. Gamora: it’s OK to be green. Now I should point out, as I have before, that our kids are not old enough to watch any of the Marvel movies yet, though we do explain various plot lines to them and leave out the parts that are…most graphic and violent? That said, it didn’t seem like a good time to tell either of my girls that before she became a Guardian of the Galaxy, Gamora did a whole bunch of dirty work for Ronan, the Kree fanatic, or that she probably listed her occupation as “assassin” on any official intergalactic paperwork. It did seem like a good time, however, for me to draw Miss Malaprop’s attention to various outrageous acts of artistic licence that MGM took when they made The Wizard of Oz way back in 1939, including the fact that in the book the Wicked Witch doesn’t have a green face at all. No, L Frank Baum did say the Wicked Witch was hideous, but he certainly did not say she was green. Then, quickly applying the First Rule of Parenting — which is, of course, Distraction — I went on to express my umbrage at Dorothy’s shoes being glittery red in the movie (no doubt sparking an untold multitude of shoe fetishes around the globe), when in the book the shoes are specifically described as being silver. Our discussion then moved on to how the movie actually finishes, and the standout role performed by Dorothy’s shoes (regardless of their colour) in returning her safely to Kansas with Toto — whose name, naturally, means “everything”. I may have proceeded to wax lyrical about how it wasn’t the Wizard of Oz who was powerful, it was Dorothy, and finally brought matters to a head when I explained that once you are no longer afraid of something, it has no power over you. 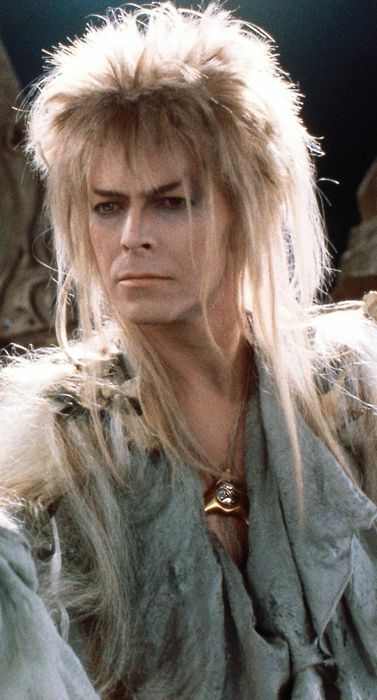 David Bowie as Jareth the Goblin King. If you want to see the spandex pants in all their glory, you’ll have to look elsewhere. Fortunately, Marvel Girl and Miss Malaprop were both fascinated by this idea, and it appeared that the image of the green faced witch was finally be fading from my younger daughter’s highly impressionable mind. Seeing the opportunity to apply the Second Rule of Parenting — which is, of course, When in Doubt Change the Subject — I sneakily steered the conversation in the direction of another movie entirely, Labyrinth, and regaled my eager listeners with tales of Sarah triumphing over the Goblin King. The kids cheered, and the rest of the evening unwound as it usually would, excepting the fact that I may have shoved a bottle of wine in the fridge — which I wouldn’t generally do on a Wednesday. And I won’t lie. I gave Miss Malaprop the most carbo-loaded evening meal she has had in very a long time, and sent her off to bed hoping against hope that digesting said dinner would act as some kind of nightmare-preventative and she would slumber blissfully until morning. To her credit — and my eternal relief — she did.